Bananya has better characterization than Rewrite | UEM! Bananya isn’t an ambitious project. But that doesn’t mean it can’t be crafted with care, and can’t succeed or fail on its own terms. It’s a childish animation about a cat who lives in a banana. The narrator stumbles as he tries to reconcile these two things, leading to humour enjoyable for all ages. As much as the narrator ‘exposits’ all that is on screen, he does so with a sense of surprise as well as understanding, and that leads to bouts of irony beyond what he merely says. 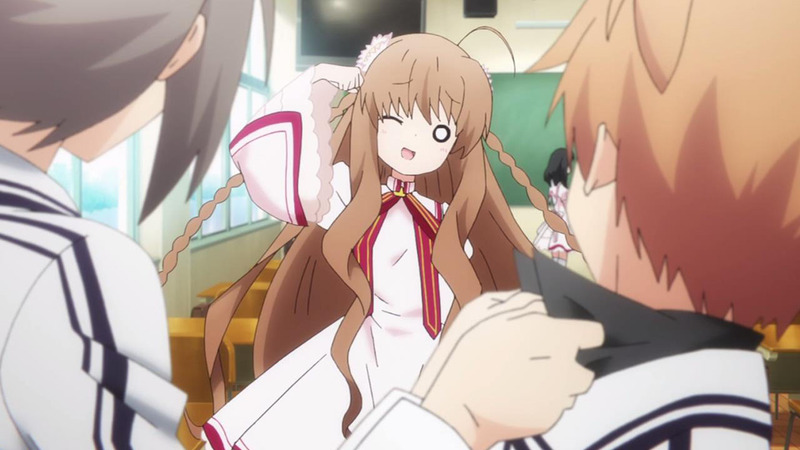 In comparison, Rewrite, the ambitious adaptation of a popular Key visual novel, has its protagonist narrate every thought the viewer could have themselves, a constant stream of ‘tell’ instead of ‘show’. At one point a character even suggests to him that he doesn’t have to give his inane commentary, but the show seems oblivious to how grating it is for him to point out every one of his thoughts out loud, and continues with this style regardless. The curiosity of Bananya as it breaks open from its skin is met with the excitement of its narrator, but it’s *our* curiosity the narrator invites in advance to the discovery of the cat who lives in this banana. In a tiny scene our engagement with the centerpiece of the story’s cast is nurtured to fulfillment. The childish tone of the narrator also fits the childish animation style, to enable us to enter into the frame of viewing the story with a child’s curiosity further. The very idea a cat could live in a banana tilts our perception towards comedy, and the conclusion that Bananya aspires to be a chocolate-covered banana both meets and twists our expectations of this cat’s view on the world. 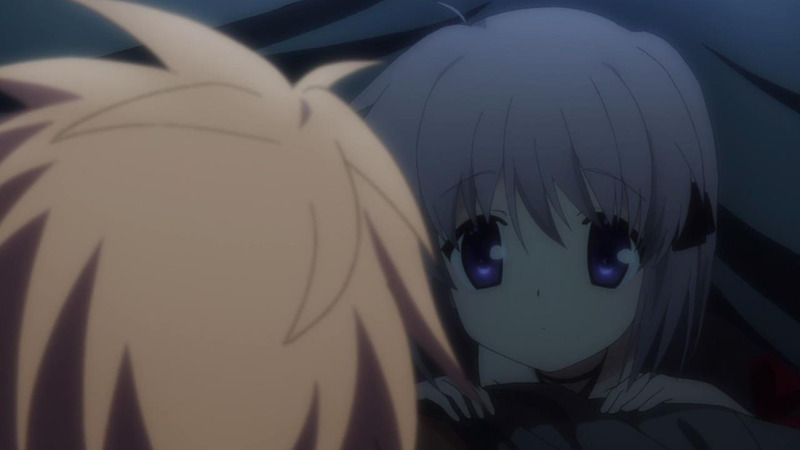 Rewrite, on the other hand, has our self-insert hero become scared at a spirit who is merely teething him merely because he died in a dream to her. He seems so scared that he’s willing to seek out help from strangers, and yet he also seems so calm about it during school life even though this spirit disturbs him every night. While Bananya is fully invested and coordinated in its curiosity, Rewrite’s protagonist is at one point scared to death and then, in the waking hours, seemingly not phased at all that the event will likely repeat. Unless he’s keeping his real feelings buried beneath him – but with no visual or auditory signifiers that such feelings are within him outside of the scenes with our ribbon-wielding Bed Intruder, we’re left unconvinced that his motivation to find the school’s witch and rid himself of this curse is genuine. He feels pulled along by the plot, rather than puling it along through his actions. Bananya, meanwhile, has absolute autonomy and surprises even its own narrator. Even the dialogue in Bananya is superior to Rewrite’s. The narrator and the cat finishing each other’s sentences is demonstrative of how this series can’t work without both of them: one trying to fully understand and relate the curiosity of the other to an audience, the other oblivious that its performance of curiosity is put on stage. 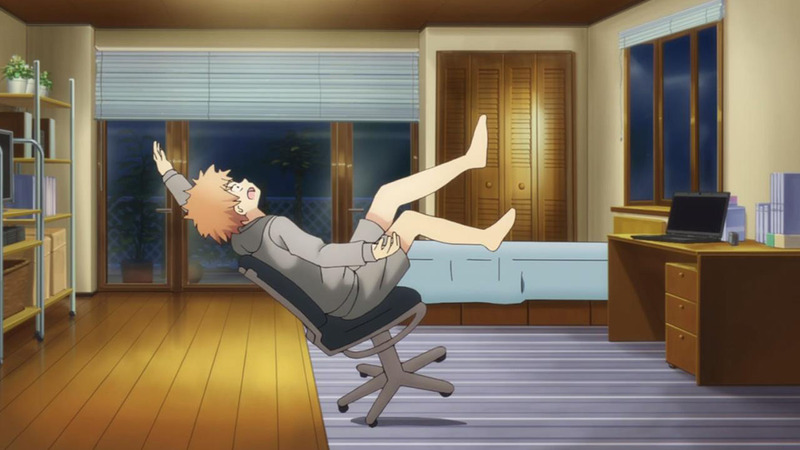 Rewrite’s dialogue, by comparison, is reduced to either exposition, our hero talking to himself and finding himself incredibly interesting by the sound of it, or conflicts being set up between him and whatever girl he has sequentially engaged into a scene with before they’re quickly torn down in order to make his unremarkable high-school paradise fulfilling before he’s earned any affection from anyone. Bananya’s setting helps characterize its hero, as the absence of people living in the house we’re introduced to speaks of his carefree independence. In what way does Rewrite’s actually-acclaimed-to-be-perfect school surroundings help us see its hero as anything more than the self insert we’ve come to be so wary of in this kind of narrative? You might think I’m having a laugh here, but I’m dead serious. Bananya had more coordinated, more engaging and more fulfilling characterization in three minutes than Rewrite had in almost an hour. Right now the question of ‘will the cat ever leave the banana skin’ is more interesting to me than coming to understand the ‘Accelerator’ and the overstated-as-an-ellipsis backstory of Rewrite’s protagonist. ← Previous Post Impressions! Spring 2016, Final Week!